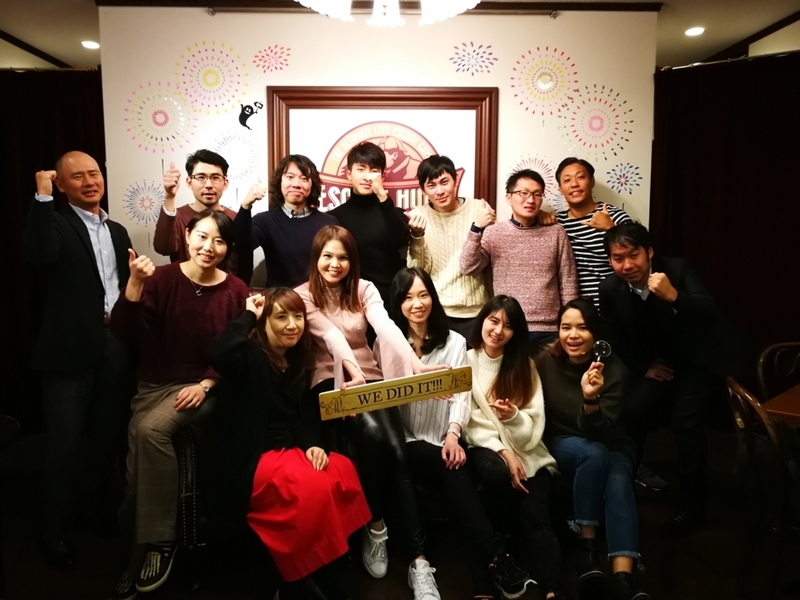 Working in the global team, which comprises of members located in Japan, Taiwan and Thailand majorly, it is much a rare opportunity to be interacting closely together physically solving puzzles and enjoying a dinner event like this. During the escape hunt, we were collecting the puzzles, clues, under limited time and trying to solve all of the puzzles under pressure. This is one of my first times working with a group trying to solve multiple riddles like this and the experience was not only pleasant by gratifying. I was teamed up with two of sales members; one from Taiwan and one from Thailand and one executive member and myself was working as the consulting team. I believe this team member was quite diverse and I was able to get perspectives from different members. Initially, we were trying to collect the clues that was sporadically hidden in the room; however, everything looked suspicious and everything seemed like a clue to us. We had found an armor, several wooden cards, locks and number symbols on the mirrors. These clues do not combine and we were not able to reach unanimity between the members. In the end, we tried to grab the first hint for our very first clue and found out. After the gamemaster, the person in charge of running the game or the referee, encouraged us to look for more wooden cards have we realized that we were on the right track but lacking the wooden cards needed to proceed. When we finally collected all of the wooden cards needed for solving the puzzle, we had to match the color orders in order to come up with the combinations that would solve the numbered lock. The opened lock led us to a whole new room and there were plenty more clues to look for. However, I was very obsessed with the left wooden cards and trying to combine the numbers on the wooden cards with the numbers on the mirror. Later have I finally realized that the numbers I have do not combine with the clues any more I should go on to look for more clues. I found out that other members were much more interested in the armor that was left aside by me and they had started building the armor. This is the reason I think team work was important-each one of us was focusing on a different clue and none of us were sure what would lead to the next clue. Finally, one of the member got a white piece of paper that he was holding, I left the wooden cards aside and looked at him afar. I saw the broken patterns on the backside of the paper he was holding, and I was reminded that a similar pattern I had found in the new room that had arrows on it too. Suddenly, I asked him if I could briefly borrow the paper and I rushed into the new room trying to recover the broken patter on the map. I found out once the patterns are matched, I could obtain the numbers that matches the arrows. The arrows allowed us to unlock a lock that enclosed a cabinet of the rest of the armors. After the armors parts were collected, we were unable to correctly assemble the lose armor to the instructions on the page. We had to finally call the lifeline and ask for the gamemaster to help us correct the armor. This is when I realized that the armor I had overlooked was very important for acquiring the next clue. As foreigners, we were not able to fully assemble the traditional Japanese armor. However, once the armor was completed and matched with the numbers on the mirror, we were able unlock the final combination lock that leads us to the final room. The final room required us to solve an arithmetic calculation. In the end, compare to the average group, we did not score very well-have we not only passed the time limit, but also asked for more clues than the average team. However, I believe that as four members that were not so used to working closely together, we worked together immediately well. We have only exceeded the time limit by a minute, but we only have four members compared to the other groups. As a tradition, we had took a few photos and received our certificate to celebrate our victory. Unfortunately, there were not many photos that we could take during the escape; as a result there was only the picture at the bottom. 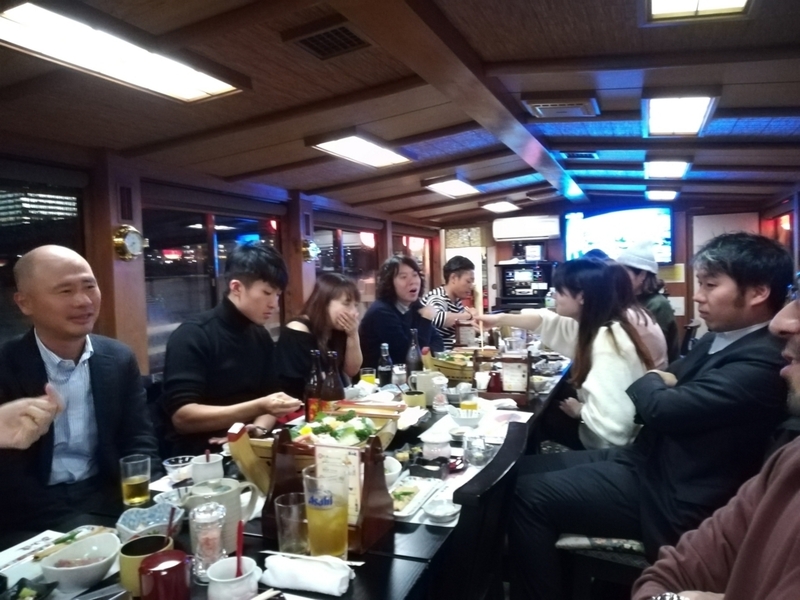 After the escape hunt, we went to a dinner on a boat party for a group of 15 members. The boat seemed quite big for our party and I hoped that we could have more members than present. However, it is indeed a rare opportunity to enjoy a yagatafune to such a small party. 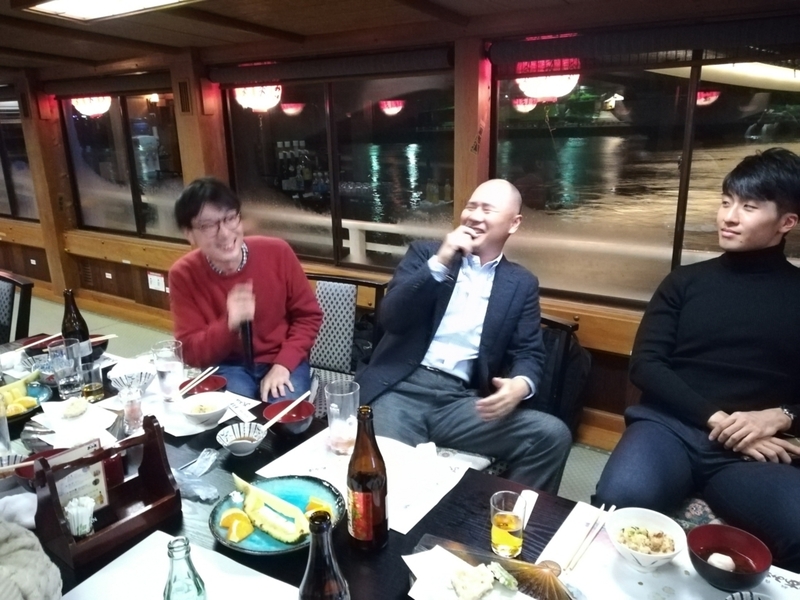 The main theme of the party was the farewell of our manager from the global team and welcoming a new manager into the team. However, since we rarely get together, I believe it was also a bit more difficult to find the common topic to talk among all of the members, luckily, beer and sake made everyone more talkative. The speech given by the ex-manager was also compelling. 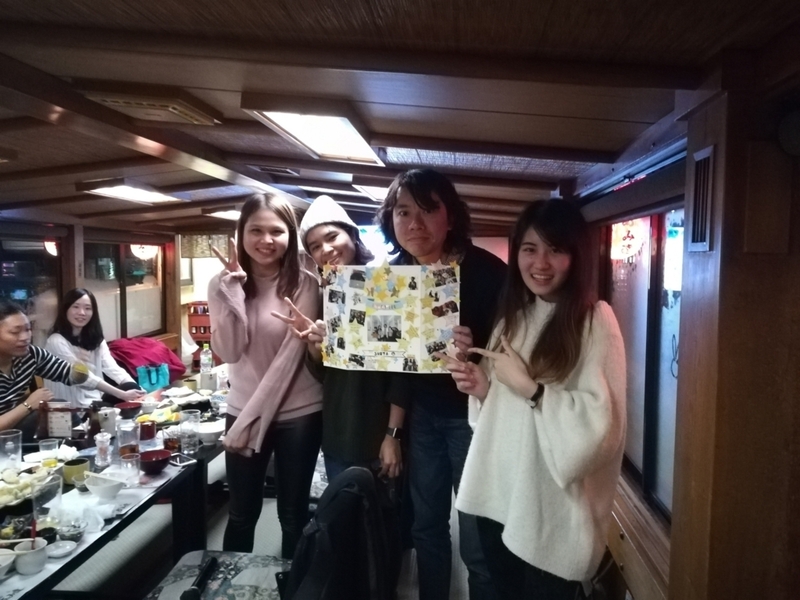 There were members that made a card for our ex-manager and handed over during the meeting and the dinner ended with lots of singing and laughter. A big 屋形船 with only about 15 members. HDE Global Sales Training: Escape Hunt ! !